BOO! ARE YOU SPOOKED!? MUHAHAHAHAHA! 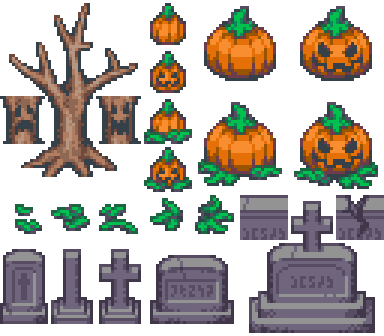 Here’s a small group of extra tiles with a Halloween theme. Halloween is more than two weeks away– there’s more time for you to put these to use! But they’re versatile enough to be used generally, I think. Doesn’t need to be October to have a spooky graveyard in your game! I was going to release them as a patron exclusive– but at the last minute I decided to release them as a freebie for everybody. I like to release holiday-themed special graphics for free.